The stages and host cities of the 2012 USA Pro Cycling Challenge (USPCC) were announced today. The race will be visiting some fantastic cities in 2012, as the organizers of the USA Pro Cycling Challenge appear to have had their pick of the best cities and roads to choose from. This is an exciting route, and many of us who have ridden in Colorado have enjoyed riding these roads and are more than happy to be sharing them with some of the best riders in the world. 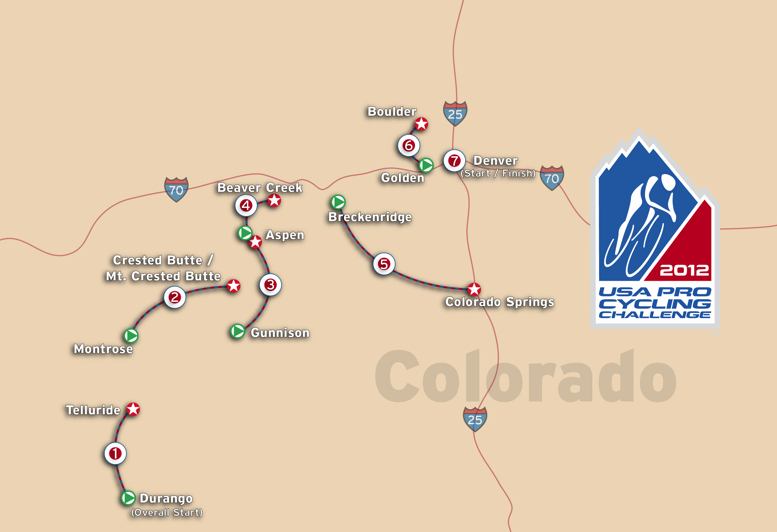 I like the looks of the USA Pro route for 2012. Dates: August 20-26, 2012, Colorado, USA. For a 7-day stage race, the organizers are presenting both a scenically marvelous and a physically challenging route for riders and fans. I can't emphasize what an incredible route this is for 2012. They have arranged to have the pros race across some of our best routes in the state of Colorado. This will be a long distance climbers race. Leave the sprinters at home (except for the really fast Italian ones). We can't automatically go to Levi Leipheimer to again take the win in 2012, Leipheimer has transferred to a new team for next season. His new ProTour Team, Omega Pharma-Quickstep, is based in Belgium. Although this is a newly merged team for 2012, neither Omega Pharma-Lotto or Quickstep raced in either the Amgen Tour of California or the USA Pro Cycling Challenge in 2011 (update: Omega Pharma-Quickstep will attend in 2012!). At this point we don't know if Levi Leipheimer, the 2011 champion, will be present in Colorado to defend his title in 2012. Although Leipheimer recently said he would be competing at both the ATOC and the USPCC Leipheimer sets targets for 2012 and stated that his new team is behind his priorities. Instead of the two time trial stages we saw in 2011 (prologue + Vail mountain time trial), we will see one flat time trial at moderate elevation through the city of Denver, the "mile high city," at 5280 feet. The unknown is what makes racing exciting and we will likely see a new overall winner in 2012. The outcome depends on who has endurance climbing form late in the season, and which teams come to compete. I am pleased to see the race extend into southwestern Colorado for 2012. However for fans this route will entail a lot of driving, Durango is an 8-hour drive from Denver (think of it as the distance from the Pyrenees to Paris). The race covers roads that beg to be ridden upon, almost more than driven upon. These are standard routes used for the week-long citizen bike tours every summer in Colorado. As a fan there are so many options to choose from in this route, it will be hard to decide where to watch the race. Again every experience will be uniquely your own and a good one. I recommend booking your vacation time to Colorado now, you'll want to be here for this week of pro racing. I am quite surprised and excited by the final individual time trial in Denver, and also by the exact repeat of what was Stage 2 in the 2011 USA Pro Challenge from Gunnison to Aspen. Last year it was incredible to be on Independence Pass as a fan, this year I want to see it all! I would suggest gathering your family and friends together, your bikes, your camping gear or suitcases and chasing the tour like a real tour junky - a little riding, a little viewing, a little driving and a lot of enjoying the mountains and people of Colorado! This year we need to bring more flags, wear more tshirts, more costumes, ride more bikes, and have more fun in support of this race! You might want to pick up some fan memorabilia now, maybe as stocking stuffers. Here in Colorado we had individuals who were trying to guess at the route long before it was announced, similar to the individuals who guessed at and leaked the routes of the 2012 Tour de France and 2012 Giro d'Italia. Looking back, the leaks and guesses for the USA Pro Challenge were pretty darn close. Specifically the Denver Post newspaper wrote extensively on the proposed route and rumored leaks. The organizers are still planning to announce the route on a live internet broadcast on Tuesday, December 13th at 5:15 p.m. MST, even though the route had been leaked to the point that they decided to announce the route a week earlier. Why aren't Ivan Basso and Jens Voigt on the list? I need to amend this poll and add Jensie!